At least three important military theorists emerged from the experience of the wars of the French Revolution and Napoleon: The Austrian Archduke Charles; the Swiss writer Antoine-Henri Jomini; and the Prussian Carl von Clausewitz. The archduke has had very little influence in the United States or Great Britain, since his work was never translated into English. *1 The military-theoretical traditions founded by Jomini and Clausewitz, however, have very definitely had an impact on our military thinking. 3. They read each other's books. Despite having these things in common, their approaches to military theory were fundamentally different, and the source of these differences can be found in their very different personalities. This is not the place to delve terribly deeply into the arcane theoretical details of these two men's work. Instead, I want to focus on the sources of our modern-day confusion: Why is it that Jomini and Clausewitz look so radically different to some observers, yet so very similar to others? I will attribute this confusion to our frequent lack of sensitivity to the differences in the two men's experiences and personalities, and to the way in which they interacted over time. Carl von Clausewitz (1780-1831) was a professional soldier from the age of 12 to his death from Cholera—a disease he incurred on active duty—at the age of 51. He first saw combat in 1794 when he was 13. He experienced first-hand Prussia's disastrous military humiliation by Napoleon in 1806, was captured, and returned to Prussia a passionate military reformer. As a junior staff officer, he worked closely with the great Prussian military reformers Gerhard von Scharnhorst (who was his mentor) and August von Gneisenau (who became his friend and protector). In 1810, he was appointed military tutor to the crown prince, for whom he wrote (in 1812) a military treatise we call The Principles of War. *7 The same year, on a matter of high principle, he gave up his commission and joined the Russian army to fight Napoleon. He fought throughout the Russian campaign and on through the Wars of Liberation of 1813 and 1814. He was Prussian III Corps chief of staff during the campaign of 1815. It was Clausewitz's corps which—outnumbered two-to-one—held Grouchy's forces at Wavre, contributing decisively to Napoleon's defeat at Waterloo. Clausewitz had a reputation in the Prussian army as both an idealist and a superb staff officer, but he was considered temperamentally unsuitable for command. No hint of personal scandal attaches to Clausewitz, and his intellectual integrity was the driving force behind the ruthless examination of military-theoretical ideas that we find in his greatest book, On War. However, while he rose very high in the King's service, he was widely considered too open to liberal ideas to be altogether politically reliable. His ideas on war are heavily influenced by the mass popular warfare of the French Revolutionary period, and those ideas were uncomfortable to conservative aristocrats. Clausewitz's relationship to Napoleon is often misunderstood. Although he is often called the "high-priest of Napoleon" (Liddell Hart's and J.F.C. Fuller's term for him), it is important to note that, in fact, Clausewitz represents not the ideas of Napoleon but rather those of his most capable opponent, the Prussian military reformer Gerhard von Scharnhorst. The man who did claim to interpret Napoleon to the military world was Antoine-Henri Jomini, later Baron de Jomini, a French-speaking Swiss (1779-1869). *8 Originally headed for a career in banking, young Jomini got carried away by the excitement of the French Revolution and joined the French army in 1798. He returned to business in Switzerland after the Peace of Amiens (1802), where he began writing on military subjects. His Traité de grande tactique was first published in 1803. He continually revised, enlarged, and reissued it into the 1850s. Rejoining the army in 1804, Jomini was accepted as a volunteer staff member by Marshal Ney (who had loaned him the money to publish his Traité de grande tactique). *9 He served in the Austerlitz and Prussian campaigns, then in Spain. He finally received an actual staff commission in the French army at the behest of Napoleon a while after Austerlitz. He served for a while as chief of staff to his long-time mentor, Marshal Ney. Jomini's arrogance, irascibility, and naked ambition often led to friction with his fellows and eventually to a falling-out with Ney. Eventually, however, Jomini was promoted to brigadier general and given a succession of fairly responsible staff positions, mostly away from actual troops. Following his recovery from the rigors of the Russian campaign, he was reassigned to Ney in 1813. However, he was shortly thereafter arrested for sloppy staff work. His ambitions thwarted by real or imagined plots against himself, Jomini joined the Russian army in late 1813. He spent much of the remainder of his long career in the Russian service. In his maturity, Jomini grew wary of the revolutionary passions that had originally inspired him to take up the sword himself. Perhaps his dependence on the czar, one of the most conservative rulers in Europe, had some influence on his attitude. It is one of the ironies of history that Clausewitz, an officer of the conservative king of Prussia, should be the one to base his theories on the most radical legacy of the revolutionary period, while Napoleon's own staff officer and interpreter, Jomini, should aim his theories at the professional officer corps of essentially eighteenth century­style armies. Jomini's military writings are easy to unfairly caricature: they were characterized by a highly didactic and prescriptive approach, conveyed in an extensive geometric vocabulary of strategic lines, bases, and key points. *12 His fundamental prescription was simple: place superior power at the decisive point. In the theoretical work for which he gained early fame, chapter XXXV of the Traité de grande tactique, he constantly stressed the advantages of interior lines. 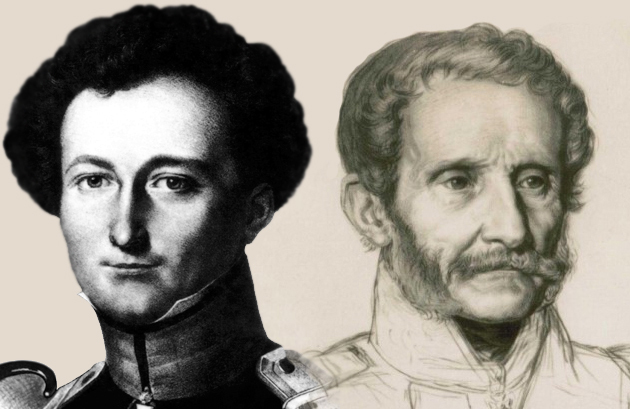 Aside from their differing relationships to Napoleon, the fundamental differences between Clausewitz and Jomini are rooted in their differing concepts of the historical process and of the nature and role of military theory. Clausewitz saw history in relative terms, rejecting absolute categories, standards, and values. The past had to be accepted on its own terms. The historian must attempt to enter into the mindsets and attitudes of any given period, the "spirit of the age." History was a dynamic process of change, driven by forces beyond the control and often beyond the comprehension of any individual or group. This historicism is particularly obvious in two key themes of On War that are missing in the 1812 Principles of War. These are the famous notion that "War is a continuation of politics with an admixture of other means" (i.e., organized violence) and the recognition that war can vary in its forms depending on the changing nature of policy and of the society within which it is waged. In contrast, Jomini's view of history and of war was static and simplistic. He saw war as a "great drama," a stage for heroes and military geniuses whose talents were beyond the comprehension of mere mortals. He saw the revolutionary warfare in which he himself had participated as merely the technical near-perfection of a fundamentally unchanging phenomenon, to be modified only by superficial matters like the list of dramatis personae, technology, and transient political motivations. He drew his theoretical and practical prescriptions from his experiences in the Napoleonic wars. The purpose of his theory was to teach practical lessons to "officers of a superior grade." Much of the contrast between Jomini and Clausewitz*14 can be traced to such philosophical factors—and to the frequent abridgement of On War, which makes it appear much more abstract than Jomini's work when in fact they often discussed the same practical subject matter. Despite his insistence that theory must be descriptive rather than prescriptive in nature, Clausewitz frequently provides instructive discussions of common military problems like contested river crossings, the defense of mountainous areas, etc. As the discussion so far has indicated, there were many parallels and many points of divergence in the personalities, military experiences, and underlying philosophies of these two men. There were also, however, some rather interesting points of intersection. Jomini and Clausewitz may have caught a glimpse of one another from opposite sides during the tragic crossing of the Beresina river during the French retreat from Moscow, but there is no evidence that they ever met. Nonetheless, they interacted intellectually, influencing one another's thinking over a long period of time. When the young Clausewitz wrote his Principles of War (1812) for his student the Prussian crown prince, he seems to have been rather taken with Jomini and his argument about interior lines. These direct but unacknowledged borrowings from On War convince many readers that the two theorists were thinking on parallel tracks. Simultaneously, the two writers' overt mutual insults tend to make other readers—those who are not familiar with both works—assume a basic contradiction in their views. However, Jomini's recognition of the validity of many of Clausewitz's points did not lead him to genuinely adopt Clausewitz's philosophy, for at least three reasons. First, he correctly distinguished his own work from Clausewitz's by pointing to its explicitly instructional (i.e., doctrinal) purposes. Despite his agreement that war was essentially a political act, he pointed to the practical implications of this different focus: "History at once political and military offers more attractions, but is also much more difficult to treat and does not accord easily with the didactic species...."
Second, and in common with a number of Clausewitz's later detractors, he found the Prussian's approach intellectually arrogant, overly metaphysical, and simply too damned difficult to digest. Jomini stressed simplicity and clarity over a "pretentious" search for deeper truths. Further, he objected to what he saw as Clausewitz's extreme skepticism ("incrédulité") of all military theory—save that in On War. For Clausewitz to reject Jomini's approach to theory while defending his own seemed somehow hypocritical. Third, there was a strong personal element in Jomini's critique of Clausewitz. Clearly, he did on some level greatly admire Clausewitz's work. He regretted that the Prussian had not been able to read his own Summary, "persuaded that he would have rendered to it some justice." He was thus deeply wounded by the criticisms in On War. He expressed his bitterness in a number of sneers (e.g., "The works of Clausewitz have been incontestably useful, although it is often less by the ideas of the author than by the contrary ideas to which he gives birth") and in accusations of plagiarism ("There is not one of my reflections [on the campaign of 1799] which he has not repeated"). These insults, because they refer to the Prussian by name, have more meaning to readers unfamiliar with On War than do the Summary's concessions on theoretical issues. The significance of all this, aside from whatever antiquarian interest it may arouse, lies in certain recent attempts to revive Jomini. These attempts are part of a reaction against the predominance of Clausewitzian theory in this country since the Vietnam war. Over the years Clausewitz has periodically been declared obsolete, only to reemerge more influential than ever. Such arguments often focus on the problem of nuclear war, but it seems increasingly likely that it is the nuclear theorists, not Clausewitz, who have been rendered obsolescent. *21 There have also been complaints by military traditionalists about the excessive influence of "Clausewitz nuts" and by theoretical purists of the "the prostitution of Clausewitz since 1981, particularly in [the U.S. Army's] FM 100­5 and its various degenerate offspring. "*22 Both complaints have some justification. The eclecticism of Anglo-Saxon military thought is rooted in the same spirit as the Latin warning, "Cave ab homine unius libri" ("Beware the man of one book"): a narrow reliance on Clausewitz is inconsistent with the philosopher's own teaching. On the other hand, using On War as a mere stockpile of juicy quotes in support of this doctrinal position or that is also an abuse. In large part, however, criticism of the new Clausewitzianism is simply reaction. Would-be competitors have little choice but to seek to dislodge the Prussian philosopher from his post-Vietnam primacy. And, of course, some people are simply tired of hearing about this long-dead genius. As David Chandler has put it, "Clausewitz's airy Kantian generalizations have held sway long enough. "*23 It is also possible that in a world seemingly freed of fundamental ideological (though obviously not nationalist) conflict, in a period in which some would seriously suppose an "end to History," Clausewitz's strife-driven world view might come to seem less relevant. *24 Chandler's suggestion that "Baron Antoine-Jomini's rival (and more prosaic) approach ... is under serious reconsideration" may be a symptom of such a trend—though one may well ask, "by whom?" Such a trend may be further encouraged by what seems to some—in forgetful retrospect—to have been the un-Clausewitzian "simplicity" of the Persian Gulf War. Perhaps the very Clausewitzian complexity of that war's aftermath will squelch the effort to renew Jomini's claim to Guru status. My own argument is that most of what Jomini had to contribute that was of real value—which was a great deal—has long since been absorbed into the way we write practical doctrine. Clausewitz's contributions, on the other hand, have not. *25 Indeed, given the brilliance and subtlety of many of Clausewitz's concepts, it is hard to see how they could ever become the "conventional wisdom." Jomini is important in a purely historical sense. In cultivating our own understanding of war, past, present, and future, we must turn to Clausewitz. 1. Lincoln's chief of staff General Henry W. Halleck is generally considered a Jominian. He was also definitely aware of Clausewitz and presumably had some notion as to his ideas. His greatest source of inspiration may, however, have been neither Jomini nor Clausewitz, but the Archduke Charles. See Thomas L. Connelly and Archer Jones, The Politics of Command: Factions and Ideas in Confederate Strategy (Baton Rouge: Louisiana State University Press, 1973, 27­28, 30, 104, 176. Russell F. Weigley adopts this view of the Archduke Charles's influence on Halleck in his article "American Strategy from Its Beginnings through the First World War," in Peter Paret, ed., Makers of Modern Strategy: From Machiavelli to the Nuclear Age (Princeton: Princeton University Press, 1986), 416­17; it did not appear in his earlier chapter on Halleck in Towards an American Army: Military Thought from Washington to Marshall (New York: 1962), in which he saw Halleck as a more original thinker, albeit heavily influenced by Jomini. 2. Mahan had become familiar with at least the broad outlines of Clausewitz's thought by the 1890s. This is the view of two naval historians, Captain (USN) William Dillworth Puleston, Mahan: The Life and Work of Captain Alfred Thayer Mahan, U.S.N. (New Haven: Yale University Press, 1939), 295, and Spector, Professors of War, 121. The editor of Mahan's papers, however, is not sure that Mahan ever read Clausewitz, and if he did, places it around 1910. See Robert Seager, Alfred Thayer Mahan: The Man and his Letters (Annapolis: US Naval Institute Press, 1978), 552, 683,n.11. I am inclined to agree with this assessment, although this does not eliminate the possibility that Mahan knew the broad outlines of On War at an earlier date. Mahan's interest is further evidenced by his marginal notes in a copy of Major Stewart Murray's 1909 condensation of On War, The Reality of War (London: Hugh Rees, 1909). Mahan's own copy has been lost, but his marginal notes were transcribed into a copy donated to the Naval War College by Puleston, Mahan's biographer. 3. Alfred Thayer Mahan, Naval Strategy Compared and Contrasted with the Principles and Practice of Military Operations on Land: Lectures Delivered at the Naval War College, Newport, R.I., between the Years 1887 and 1911 (Boston: Little, Brown, and Company, 1911; reprinted Westport, Conn.: Greenwood Press, 1975), contains two explicit references to Clausewitz. One is a footnote reference (120) to Clausewitz's sarcastic discussion of "keys," (Book VI, Chapter 23 of On War). The other (in which Mahan refers to Clausewitz as "one of the first of authorities") is a reference to Corbett citing On War on the relative strengths of defense and offense (279). This is part of an extended discussion of some importance, in that Mahan is comparing the naval and land aspects of strategy, and he is clearly discussing the Clausewitzian interpretation without identifying it as such. [He used virtually the same phrasing in his discussion of some naval wargames in a letter to Raymond P. Rogers, 4 March 1911, in Alfred Thayer Mahan, eds. Robert Seeger II and Doris D. Maguire, Letters and Papers of Alfred Thayer Mahan (Annapolis: Naval Institute Press, 1975.)] Mahan also discusses "ends and means" at some length (esp. p5), in a manner strongly reminiscent of Clausewitz. 4. See Puleston, 295; Spector, 121. 5. While he thought that the equally great British Clausewitzian Julian Corbett was wildly wrong in his interpretations. 6. Michael I. Handel, Masters of War: Sun Tzu, Clausewitz and Jomini (London: Frank Cass, 1992). 7. Carl von Clausewitz, trans. Hans W. Gatzke, Principles of War (Harrisburg, PA: The Military Service Publishing Company, 1942); reprinted in Stackpole Books, Roots of Strategy: Book 2, 3 Military Classics. Harrisburg, PA: Stackpole Books, 1987. [Originally "Die wichtigsten Grundsatze des Kriegfuhrens zur Erganzung meines Unterrichts bei Sr. Koniglichen Hoheit dem Kronprinzen" (written in 1812; trans. from the 1936 German edition).] Another translation appears as an appendix to J.J. Graham's 1873 translation of On War. 8. On Jomini, see Crane Brinton, Gordon A. Craig, and Felix Gilbert, "Jomini," in Edward Mead Earle, ed., Makers of Modern Strategy: Military Thought from Machiavelli to Hitler (Princeton: Princeton University Press, 1944); Michael Howard, "Jomini and the Classical Tradition," in Michael Howard, ed., The Theory and Practice of War (New York: Praeger, 1966); John Shy, "Jomini," in Peter Paret, ed., Makers of Modern Strategy: From Machiavelli to the Nuclear Age (Princeton: Princeton University Press, 1986). 9. The best English-language discussion of Jomini's military career can be found in John R. Elting, "Jomini: Disciple of Napoleon?" Military Affairs, Spring 1964, 17-26. Unlike most biographical discussions of the Swiss, which are based on his own highly colored reminiscences to people he wished to impress, Elting's study is based on Xavier de Courville, Jomini, ou de le Devin de Napoleon (Paris, 1935). "Written by Jomini's descendants, from his personal papers, it is the most impartial of his biographies." 10. Elting, "Jomini: Disciple of Napoleon?" 11. [Francis Egerton, Lord Ellesmere], "Marmont, Siborne, and Alison," Quarterly Review, v.LXXVI (June and September 1845), 204­247, a joint venture of John Gurwood, Egerton, and Wellington himself. See Archives of the John Murray Company, manuscript index to v.LXXVI, Quarterly Review; J.H. Stocqueler (pseud. ), The Life of Field Marshal the Duke of Wellington (London: Ingram, Cooke, and Company, 1853), v.II, 330. 12. See, for example, Articles XVIII-XXII of the Summary. 13. For Jomini's theoretical writings in English translation, see Antoine­Henri Jomini, trans. Col. S.B. Holabird, U.S.A., Treatise on Grand Military Operations: or A Critical and Military History of the Wars of Frederick the Great as Contrasted with the Modern System, 2 vols. (New York: D. van Nostrand, 1865); Baron de Jomini, trans. Major O.F. Winship and Lieut. E.E. McLean, The Art of War (New York: G.P. Putnam, 1854). Important derivative works include Dennis Hart Mahan's instructional works for West Point; Henry Wager Halleck, Elements of Military Art and Science (New York: D. Appleton and Company, 1846); Edward Bruce Hamley (1824­93), The Operations of War Explained and Illustrated (London: William Blackwood and Sons, 1866). 14. Most discussions of Jomini compare him to Clausewitz. For explicit efforts to do so, see Department of Military Art and Engineering, USMA, Clausewitz, Jomini, Schlieffen (West Point, 1951 [rewritten, in part, by Colonel [USA] John R. Elting, 1964]); J.E. Edmonds, "Jomini and Clausewitz" [a treatment extremely hostile to the German], Canadian Army Journal, v.V, no.2 (May 1951), 64­69; Joseph L. Harsh, "Battlesword and Rapier: Clausewitz, Jomini, and the American Civil War," Military Affairs, December 1974, 133­138; Major [USAF] Francis S. Jones, "Analysis and Comparison of the Ideas and Later Influences of Henri Jomini and Carl von Clausewitz," Paper, Maxwell Air Force Base, AL: Air Command and Staff College, April 1985; Colonel [USA] Richard M. Swain, "`The Hedgehog and the Fox': Jomini, Clausewitz, and History," Naval War College Review, Autumn 1990, 98-109. 15. Gatzke, Principles of War, 49 (p39 in Cochenhausen, Grundsatze). 16. Clausewitz, Gatzke ed., Principles of War, 12; Cochenhausen, Grundsatze, 9. See also pp 22/17). 17. On War, Book Two, Chapter 2. Note here (as many readers fail to do), that Clausewitz is being sarcastic here. There are two sentences in the last paragraph of this quotation. The first of these two sentences is a bitter joke. The second is entirely sincere. 18. In later versions of the Treatise, Jomini dropped his insistence on interior lines, acknowledging á la Clausewitz that the value of interior or concentric lines depended on the situation. (Holabird, 450-451). 19. These points are most easily found in the bibliographical essay which opened the original French edition of the Summary, "Notice: sur la théorie actuelle de la guerre et sur son utilité" ("On the Present Theory of War and of Its Utility"). This essay is missing from (or severely edited in) most English language editions, although it is present in the 1854 American translation. 20. Jomini, trans. Mendell and Craighill, Summary, 66; Clausewitz, On War, 88-89. 21. John E. Shephard, Jr., makes a recent case for Clausewitz's partial obsolescence in "On War: Is Clausewitz Still Relevant?" See also Bruce R. Nardulli, "Clausewitz and the Reorientation of Nuclear Strategy," Journal of Strategic Studies, December 1982, 494-510. 22. Achenbach, "War and the Cult of Clausewitz," quoting Colonel (USA, retired) Arthur Lykke, a senior professor of strategy at the Army War College; Colonel [USA, ret.] Lloyd Matthews, editor of Parameters, letter 17 July 1989. 23. David G. Chandler, in an enthusiastic review of Weigley's Age of Battles, Journal of Military History, April 1992, 294-295. 24. Martin van Creveld attempted in The Transformation of War (New York: Free Press, 1991) "to construct a different, non-Clausewitzian and non-strategic, framework for thinking about war." He argues that war in the post­Cold War era is driven by forces outside the nation-state system and beyond the rational boundaries allegedly emphasized in On War. The pattern of conflict in the post­1945 world no longer yields to the "Clausewitzian assumption that war is rational." In this view, the "Clausewitzian universe" is obsolete because it is centered on warmaking by the "state"; Clausewitz's alleged trinity of government, army, and people is therefore not applicable to Europe before the Treaty of Westphalia nor to the world emerging from the Cold War era. 25. Bernard Brodie often made puzzled references, e.g., "The Continuing Relevance of On War," 50, to the failure of modern military thought to incorporate and supersede Clausewitz, in the manner in which, say, Adam Smith's contribution to economics has been. Clausewitz, Carl von, trans. Colonel J.J. [James John] Graham. On War. London: N. Trübner, 1873. Clausewitz, Carl von, trans. Hans W. Gatzke. Principles of War. Harrisburg, PA: The Military Service Publishing Company, 1942; reprinted in Stackpole Books, Roots of Strategy: Book 2, 3 Military Classics. Harrisburg, PA: Stackpole Books, 1987. [Originally written 1812: Carl von Clausewitz, General Friedrich von Cochenhausen, ed. "Die wichtigsten Grundsatze des Kriegfuhrens zur Erganzung meines Unterrichts bei Sr. Königlichen Hoheit dem Kronprinzen. Berlin: Junker und Dünnhaupt Verlag, 1936.] Another translation appears as an appendix to J.J. Graham's translation of On War. Clausewitz, Carl von, eds./trans. Michael Howard and Peter Paret. On War. Princeton: Princeton University Press, 1976. Courville, Xavier de. Jomini, ou de le Devin de Napoleon. Paris, 1935. Elting, John R. "Jomini: Disciple of Napoleon?" Military Affairs, Spring 1964, 17-26. Edmonds, Brigadier General Sir J.E. "Jomini and Clausewitz." Canadian Army Journal, v.V, no.2 (May 1951), 64­69. Harsh, Joseph L. "Battlesword and Rapier: Clausewitz, Jomini, and the American Civil War." Military Affairs, December 1974, 133­138. Jomini, Henri. Traité de grande tactique, ou, Relation de la guerre de sept ans, extraite de Tempelhof, commentée at comparée aux principales opérations de la dernière guerre; avec un recueil des maximes les plus important de l'art militaire, justifiées par ces différents évenéments. Paris: Giguet et Michaud, 1805. Jomini, Baron de, trans. Major O.F. Winship and Lieut. E.E. McLean [USA]. The Art of War. New York: G.P. Putnam, 1854. Jomini, Baron de, trans. Capt. G.H. Mendell and Lieut. W.P. Craighill [USA]. The Art of War. Philadelphia: J.B. Lippincott, 1862; reprinted, Westport, CT: Greenwood Press, 1971; reprinted, with a new introduction by Charles Messenger, London: Greenhill Books, 1992. Jomini, Antoine­Henri, trans. Col. S.B. Holabird, U.S.A. Treatise on Grand Military Operations: or A Critical and Military History of the Wars of Frederick the Great as Contrasted with the Modern System, 2 vols. New York: D. van Nostrand, 1865. Jones, Archer. "Jomini and the Strategy of the American Civil War: A Reinterpretation." Military Affairs, XXXIV, December 1970, 127­131. Williams, T. Harry. "The Return of Jomini: Some Thoughts on Recent Civil War Writing." Military Affairs, December 1975, 204­206.